A fusion gene is a hybrid gene formed from two previously separate genes. It can occur as a result of translocation, interstitial deletion or chromosomal inversion. Known to scientists since 1960, fusion genes can contribute to tumor formation because fusion genes can produce much more active abnormal protein than non-fusion genes. Often, fusion genes are oncogenes that cause cancer. Presence of certain chromosomal aberrations and their resulting fusion genes is commonly used within cancer diagnostics in order to set a precise diagnosis. Chromosome banding analysis, fluorescence in situ hybridization (FISH), and reverse transcription polymerase chain reaction (RT-PCR) are common methods employed at the Mayo Medical Laboratories to detect fusion genes. In recent years, next generation sequencing technology has already become available to screen known and novel gene fusion events on a genome wide scale. Recent research at the Mayo Medical Laboratories has led to a breakthrough in diagnosing fibrolamellar carcinoma, a rare liver cancer that affects primarily young patients without underlying cirrhosis. The following article comes from Mayo Medical Laboratories and, while quite technical, involves the precision that genomics brings to individualized medicine. Mayo Clinic researchers recently developed a reverse transcription polymerase chain reaction (RT-PCR) assay along with a break-apart fluorescence in situ hybridization (FISH) assay that can diagnose fibrolamellar carcinoma 100 percent of the time. The assays can detect the novel fusion at the transcriptional and genomic level, respectively. Fibrolamellar carcinoma is a rare subtype of hepatocellular carcinoma — the most common type of liver cancer. Approximately 50 new cases of fibrolamellar carcinoma are diagnosed each year in the U.S., and predominantly affects young patients without underlying cirrhosis (most conventional liver cancers arise in cirrhotic livers). The tumor is characterized by a unique intratumoral fibrosis that often has a lamellar pattern and large eosinophilic cells. Recently, a recurrent fusion gene, DNAJB1-PRKACA, was reported in fibrolamellar carcinomas. However, the specificity of this fusion in the context of other primary liver neoplasms remained unknown. In the Mayo Clinic study, published in Modern Pathology, a total of 26 fibrolamellar carcinomas were reviewed, including 19 cases from Mayo Clinic and seven cases from the University Hospital of Heidelberg, Germany. 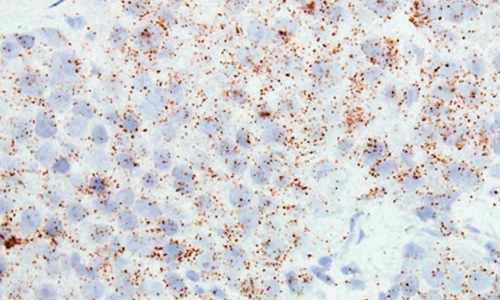 Testing confirmed the presence of the DNAJB1-PRKACA fusion in all 26 fibrolamellar carcinomas. The fusion is present in essentially all tumor cells, suggesting it is an early mutational event in the development of fibrolamellar carcinoma. Based on a survey of an additional 105 primary liver tumors, the DNAJB1-PRKACA fusion gene appears to be specific, indicating it will be a useful diagnostic assay. The study results demonstrate that morphologically distinct variants of hepatocellular carcinoma may be associated with unique genetic changes, allowing for a morphology-based subclassification that reflects specific genetic-driver events. Several tumor types, including lung and breast cancer, are currently much further along in terms of targeted therapies when compared to liver cancer. This is in great part because many subtypes of these cancers have been recognized and understood on a histological, morphological, and molecular level. Dr. Graham and the Mayo team of researchers are striving to uncover the subtypes of liver cancer so that ultimately, patients will have more treatment options.